This Expert Advisor (EA) assists traders with semi-auto trading. When the price touches or crosses the Trade Line, the EA takes the order. All smart features like dynamic "Take Profit" and "Stop Loss" calculation, Trail, Break Even point calculation, Time Management and Spread control has been included in this EA. 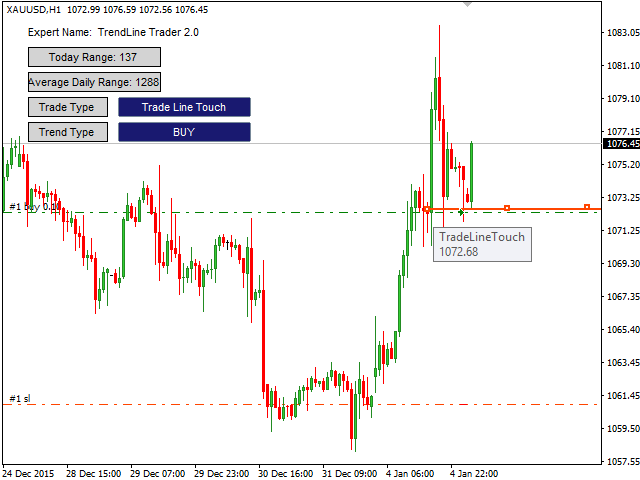 Money Management feature is available at paid version, "Triangle trader". Download "Triangle Trader" as full feature of "Trade Line Trader" for free. This limited offer will expire in 7 days and after that price will return to market price of 59$. By adding a review of 5 stars you will benefit from next updates for free. Many professional traders trade on simple and clear charts by drawing a single trend line and using a break-out or reversal strategy. 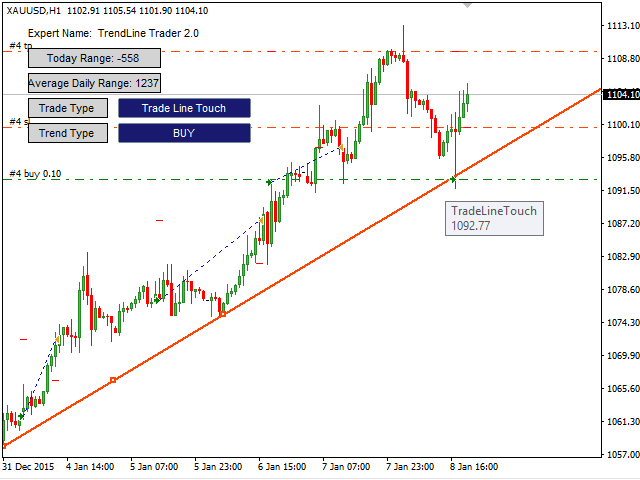 This EA assists the traders to trade with the trend direction based on plotted lines and a simple control dashboard over the chart. So this EA assists the traders to trade in the trend direction by plotting a trend line in chart with a simple control dashboard over the chart. 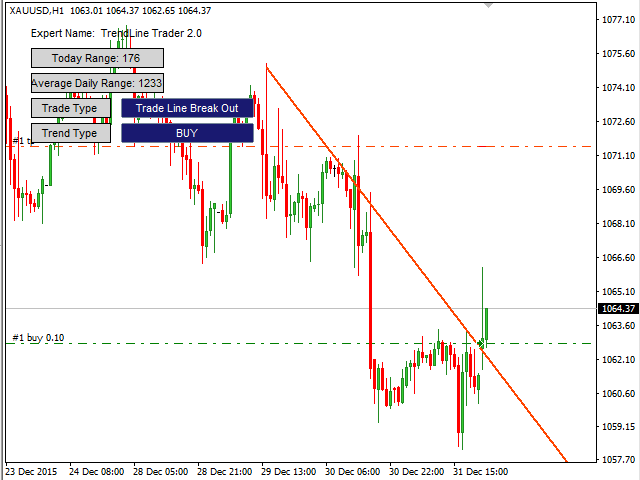 Trend Line acts as a guidance for the EA and shows the trend direction. Type of TREND (EA Input and accessible via Dashboard) can be set to SELL, BUY, SIDE and Trend Line. 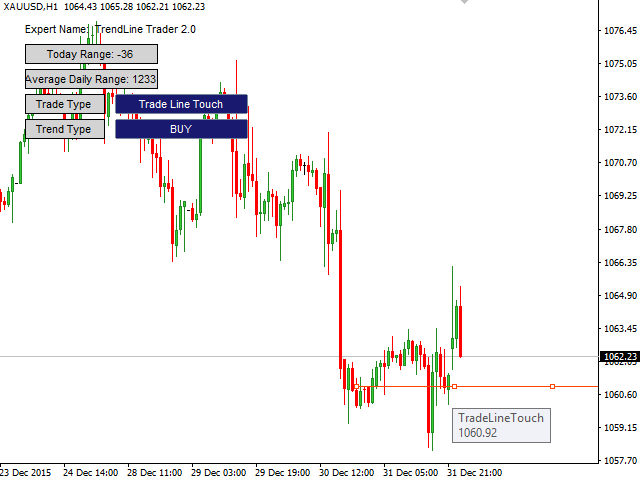 Trade Line acts as a trigger for position entry. 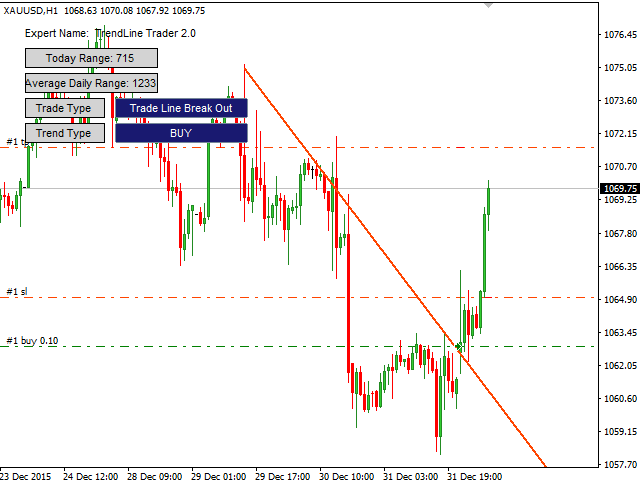 Trade Line lets trader to use two powerful strategies for market entry, the Break-Out and Reversal strategy. When the price gets to the resistance/support levels, two outcomes are possible. Price may break-out the level or price may reverse. Type of Trade Line (EA Input) can be set to Trend Line Cross when the trader estimate the price is going to break out the key level. It can be set also to Trend Line Touch when the trader estimate the price is going to reach the key level and will reverse. It can be set to Dual Line Touch Cross when the trader decides to engage both Break-Out and Reversal strategies together. The EA will plot two lines over the chart. The first line cause the EA to take position when the price/candlestick crosses the line and the second line cause the EA to take position when the price touches the line. Time Frame: It is the time frame on which the trader is going to trade. Candlestick close, TakeProfit and StopLoss calculation is based on it. Type of trade line: It can be set to "Trade Line Cross" for breakout strategy, can be set to "Trade Line Touch" for reversal strategy or can be set to "Dual line touch-cross" to use both of strategies. Type of trend: It can be set explicitly to SELL, BUY and SIDE. For dynamic trend detection it can be set to "Trend Line" — the trend direction depends on how the trader draws the "Trend Line", if the price level is below or above the "Trend Line". How to Calc SL, TP: It can be set to "Nothing" for no Stoploss/Takeprofit, "AvrgVolatility" to calculate StopLoss and TakeProfit based on average market range and "Static" to calculate it equal to "Min static Takeprofit" and "Min static Stoploss". 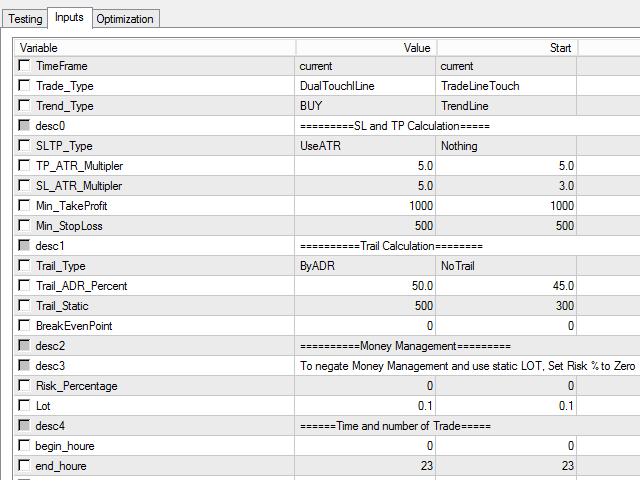 TP Multiplier(ATR): ATR (Average True Range) multiplier for TakeProfit calculation. SL Multiplier(ATR): ATR (Average True Range) multiplier for StopLoss calculation. Min/Static TakeProfit: Minimum desired value in points (not in pip) for TakeProfit. Min/Static StopLoss: Minimum desired value in points (not in pip) for StopLoss. Trail Type: Can be set to "AvrgDailyRange" that it is based on a percentage of Average Daily Range, "Nothing" to trade without trailing, "LastLowCandle" to begin trailing when the position is in profit at "Static Trail (point)" and set the SL distance at the Last Candle High/Low. Trail after % daily range: The percentage that will apply to Average Daily Range for trailing calculation. Trail Static (point): Trailing based on a static amount of points (not in pips) or as a value for "LastLowCandle". Break Even after (point): The number of profit points that a position has made to the StopLoss to break even. Static Lot size: The static lot size instead of dynamic Money Management. Begin Hour to trade: EA operation timing, the EA will open trades after "Begin Hour". End Hour to trade: EA operation timing, the EA will not open trades after "End Hour". ID Number of trades: The unique number used to distinguish the positions that belong to this EA from other positions. Идея советника отличная! Остальное"в руках трейдера". - Bug fix. The EA stopped trading in some limited conditions and now it is fixed. - The EA maintains the plotted "Trade Line" in the chart when trader changes the EA inputs and the EA does not redraw "Trade Line" in preset value.